Things sure aren’t working out as a lot of Democratic leaders had anticipated. The whole point in an “establishment candidate” is to have a candidate who is well vetted and safe, not one embroiled in scandal and whose activities are under investigation by the Justice Department, is distrusted by a solid majority of voters, and is running a terrible campaign. This is leading to increased speculation, and hope, that someone other than Clinton might win the Democratic nomination, as opposed to risking disaster in 2016 with Clinton heading the ticket. At the Huffington Post support for the presumptive Democratic nominee is not automatic. H.A. Goodman argues that With the FBI Investigating Clinton’s Emails, Bernie Sanders Should Be Considered the Democratic Frontrunner. Up until now, the view that Hillary Clinton is the Democratic frontrunner was bolstered by an ever-dwindling poll among Democratic voters between the former Secretary of State and the Vermont Senator. However, with major polls today showing Sanders challenging or defeating Clinton and Republican, conventional wisdom has allowed the possibility of Clinton possibly losing a second run at the presidency. Furthermore, the momentum generated by the Sanders campaign is genuine and will only increase (among all demographics) with greater name recognition across the country. Most importantly, Bernie Sanders is the only Democrat gaining attention nationwide who isn’t linked to an FBI investigation. Why some Democrats still continue to believe a candidate can win the White House with the Justice Department, FBI, and other intelligence agencies investigating this candidate’s email practices, seems to overlook one obvious fact. Nobody has ever won the White House with an ongoing FBI and Justice Department investigation, and it doesn’t seem that the FBI or Justice Department will cease investigating Clinton’s email saga by Election Day; 444 days away. Sanders is already doing far better than expected, and is further working to broaden his appeal. Despite his successes, there is still talk of a more establishment candidate getting into the race to challenge Clinton, or be there should her campaign totally collapse. While I doubt there would be an indictment of a major contender in the midst of a campaign, many people have been prosecuted (and convicted) for less wrongdoing than the evidence shows has been done by Clinton. … some Democrats supporting Mrs. Clinton have quietly signaled that they would re-evaluate their support if Mr. Biden joined the race. For example, Tom Daschle, an influential former Senate Democratic leader who has given the maximum amount allowable to Mrs. Clinton’s campaign, has indicated that he would reassess his position if Mr. Biden entered the race, according to people who have been in contact with him in recent days. In addition, a “Draft Biden” group has started to build an infrastructure to use if the vice president enters the race. After initially focusing on raising money for their effort, they have begun to hire field organizers. “Over the next few weeks we hope to expand our operations so we can communicate with more voters about Vice President Biden’s record,” said Josh Alcorn, a Biden family friend working for the group. Mr. Biden’s supporters have, in private conversations, signaled that if he does enter the race he will portray himself as the rightful heir to Mr. Obama’s legacy, given his loyalty to the president. 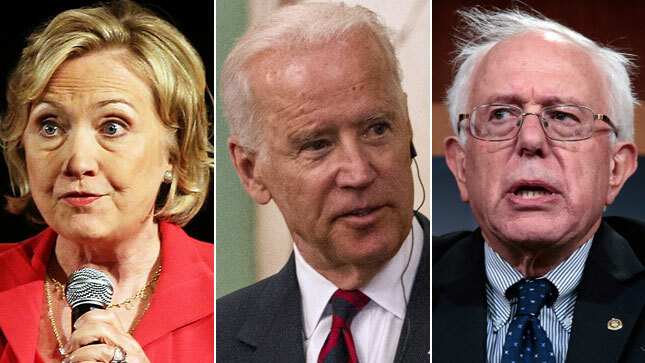 They also argue that given the unpredictability of a campaign season in which both Bernie Sanders and Donald J. Trump have won a following, it is folly to dismiss Mr. Biden’s chances. Only Joe Biden really knows how likely it is he will enter the race. He is certain to make his own decision, considering what he thinks his chances of winning are. This might be improved as Democrats consider a recent poll showing Biden to be more competitive in battleground states where Clinton has been struggling in general election match-ups. I see it as a positive move if Biden enters the race as I see running with a ticket led by Hillary Clinton being far too risky. Possibly Biden will divide the establishment vote and make it easier for Sanders to win. I also fear the system might be too rigged to support an establishment candidate for the nomination, and if that is the case I would much rather it be Joe Biden than Hillary Clinton. Update: Joe Biden meets with Elizabeth Warren. Posted in Bernie Sanders, Democrats, Donald Trump, Hillary Clinton, Joe Biden, Politics. Tags: Bernie Sanders, Democrats, Donald Trump, Hillary Clinton, Joe Biden, Politics. RSS feed for comments on this post.. TrackBack URL. Lock Clinton up for treason! We will elect Bernie. Then Bernie's polit-bureau will lock you up for treason! Does anyone actually believe Bernie can win the General if Hillaryites don't support him?? If they do they are freakin" delusional. With that said, how are all these extremely derogatory comments about Hillary – Helping Bernie? Sometimes, it is best to keep things like that close to the vest. David, locking people up for treason sounds far more like something we would expect from Republicans, and Clinton. Frank, that comment is wrong on so many levels. But what if I was using the blog purely to help Bernie? Then it would still make more sense to get out the information on Clinton. The way the party rules are written, Sanders is extremely unlikely to beat Clinton in a two way race, unless Clinton’s negatives are fully considered. Sure Obama beat her, but he received establishment support, such as from Ted Kennedy, Caroline Kennedy, and John Kerry to bolster his campaign. Plus in 2008 Hillary’s unethical behavior became a big reason why many establishment Democrats backed Obama over her. Discussing this helped Obama. Bloggers such as myself were quite critical of Clinton throughout the primaries. That didn’t keep Obama from winning. Bernie Sanders will win the nomination. I have no doubt about that. The reason is, people really feel betrayed by all parties and Bernie represents the candidate that didn't have to sacrifice integrity for any party. He didn't take money from special interest, which means he doesn't have to please anyone and he didn't flip his position on any issue. He doesn't have to sell himself, his can just refer to his record. Social media is exploding from his supporters and I'm one of them. I think that if Warren came out for or was running on Sanders' ticket, you'd hear a lot more buzz. Keep in mind, tho, lots and lots of time left in this race. People are really grasping at straws, and seem so opposed in most media, to the idea of Sanders as president. Look at how biased this article alone is. He's outpolling her in multiple swing states, and Biden's not even in the race, and they're making it out like Biden's more of a threat than Bernie is. That's alright, the more surprising it is, the sweeter it'll be to see when it happens. I think Bernie might make a stronger general election candidate than Clinton or Biden because of the current distaste for the status quo, but he will have more difficulty winning the nomination because of the advantages party rules give to the more establishment candidates. Note how they are limiting debates to protect Clinton. Sanders has to receive well over half of the delegates won in primary and caucus states to win the nomination, unless he can win over the super delegates. Because of this, I think Biden could be a greater threat within the Democratic party of winning the nomination. Insurgent candidates rarely win the nomination. Obama was the exception, but he benefited from a lot of Democratic insider support which I don't know if Sanders can get. Biden getting in would also help Sanders by dividing the party establishment. Of course if the sandals should worsen, we could come to a point where virtually anyone could beat Clinton, but this may or may not happen.